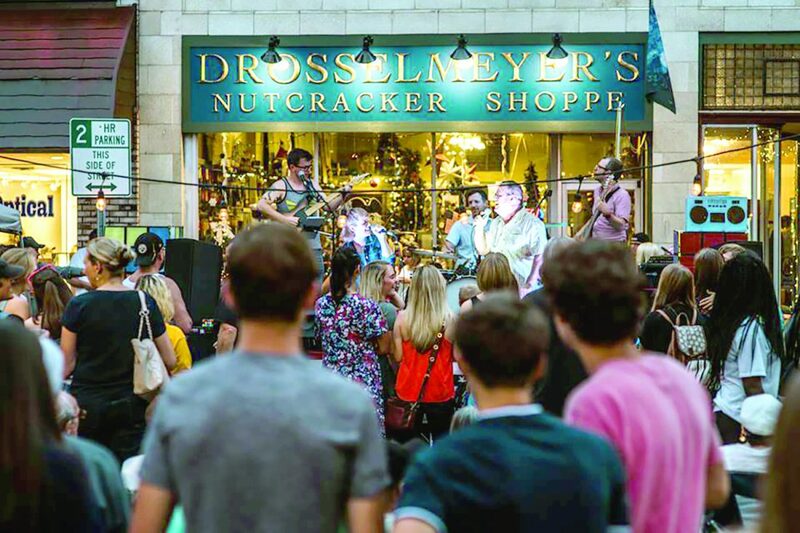 LIVE MUSIC FEATURED — Live music in front of downtown storefronts drew a crowd during last year’s First Fridays on Fourth celebration. STEUBENVILLE — Therese Nelson hopes the day comes when Steubenville won’t need the First Fridays on Fourth events to bring people and business downtown. But until it does, she said they’ll go on planning the monthly street festivals. First Fridays on Fourth are themed events held on, of course, the first Friday of each month beginning in April and continuing through November. April’s theme is fish fry and November’s, Halloween. In between they’ll be celebrating Art Festival (May 3); Frontier Days (June 7); Cookout/Freedom Friday (July 5); 80s Edition (Aug. 2); Irish Fest (Sept. 6) and Half Hills Music Fest (Oct. 4). “I think a lot of people saw what we were trying to do (last year), they were able to get on board and realize it’s not just wishful thinking,” she said. 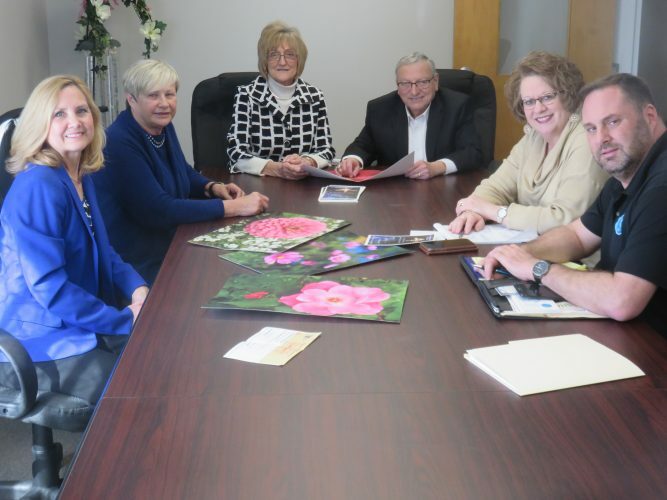 Nelson describes it as a kind of community stepping stone — a fun way to build civic pride and get people comfortable with the idea they can spend a fun afternoon or evening walking around downtown with family and friends. The games, food trucks, vendor booths, art displays and live entertainment that are part of First Fridays are a snapshot of what the downtown could be with a little TLC, she said. “We want to get building owners to let us use their storefronts for displays,” Nelson said. “We’d like the buildings to post the owners name and contact information, potential uses and maybe a little about previous uses — all the information someone would need if they were looking” for a business opportunity. This year the public will also be able to enjoy horse-and-carriage rides through the downtown, as well as more art galleries and “installation art” — that’s bigger, three-dimensional pieces where the arrangement itself makes a statement. Nelson said installation art can be as simple as, say, a stack of lawn chairs arranged in a specific way. “It’s modern art, statement art,” she said. April’s celebration is typically smaller due to uncertainty about the weather, she said, but it will still be busy: She said they’ll be encouraging the First Fridays crowd to decorate wooden eggs for an Easter installation art piece. Nelson said the Grand Theater will host a “Battle of the Bards” throughout the First Fridays season: Each month two groups of actors will go head-to-head, each performing a locally written, 10- to 15-minute skit. Viewers will watch each entry, then decide which one they want to bring back the following month for a sequel. In April, they’ll also be doing an Easter egg hunt for kids, with live music and a variety of vendors keying on the fish fry theme. She said other organizations are also looking at ways to get involved. Smitty’s, for instance, is working on a Friday night wrestling event. Others are discussing the possibility of hosting a three-on-three basketball competition, or trying to get the go-ahead for things like a 5-K race or a square dance. Nelson said the more, the merrier. “People want to tag (activities) onto First Fridays because it’s bringing people down here,” she said. “What we would hope is that in five or 10 years, there’ll be movies playing at the Grand, more restaurants where people can eat, a craft brewery and stores” lining the streets, she said.